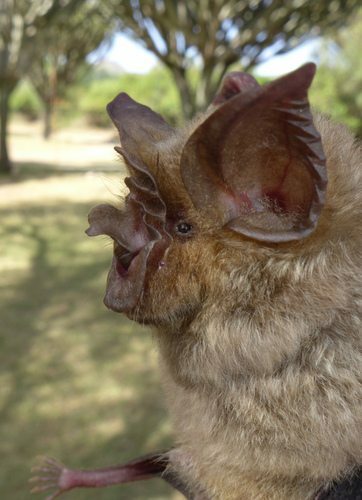 A couple weeks ago, Dr. Bruce Patterson (the curator of mammals at The Field Museum in Chicago) was kind enough to send me some very high quality recordings of bat vocalizations captured during his recent expedition to Kenya. 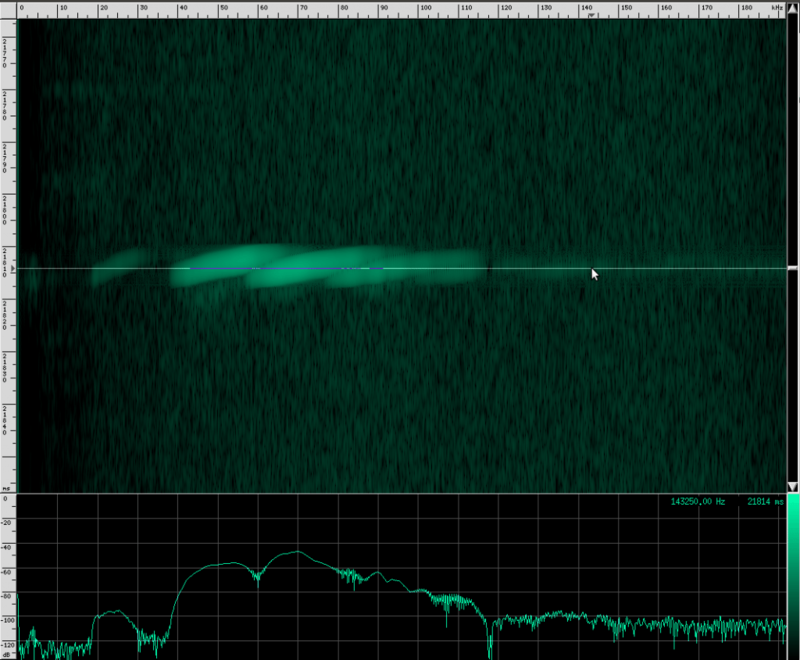 Bats use a lot of the same DSP techniques that sonar and radar use, and I thought it would be interesting to take a closer look. Having the original recordings is really useful for doing analysis because I know that they haven’t been shifted down into the human hearing range and they haven’t been resampled or compressed, so all of the original data is there. Bats produce sounds that are anywhere from 14 kHz to over 100 kHz, so that means to collect bat recordings, you need a microphone with a good frequency response at those frequencies and you need to be sampling fast enough to accurately capture it. 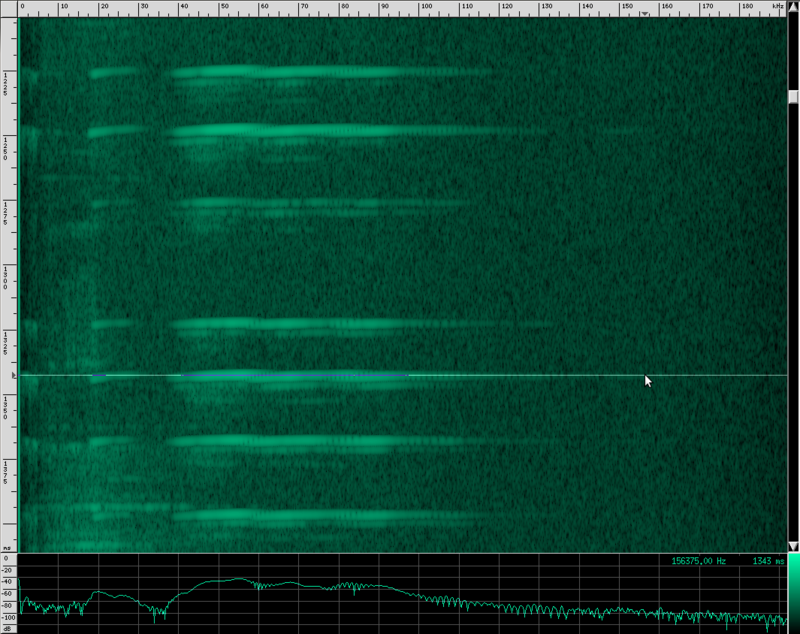 The files I analyzed were captured at 384 kHz, which means they should be able to unambiguously represent frequencies up to 192 kHz. The files were all uncompressed WAVs and were recorded with microphones that were capable of capturing ultrasonic frequencies. Not all bats echolocate. There are two classes (the correct taxonomic term would be suborders) of bats: microbats and megabats. Microbats (suborder Microchiroptera) are usually the smaller of the two, but there are exceptions. Microbats all use echolocation and have a few morphological differences from megabats, the most important for this discussion being larger ears for their size and smaller eyes. Megabats (suborder Megachiroptera, family Pteropodidae), don’t echolocate, with the exception of one species, Rousettus aegyptiacus. The bats I got recordings of were Cardioderma cor (the Heart-Nosed bat), Lavia frons (the Yellow Winged bat), Nycteris thebaica (the Egyptian Slit-Faced bat), Rhinolophus clivosus (Geoffroy’s Horseshoe bat), and Rhinolopgus eloquens (the Eloquent Horseshoe bat). Not all bat vocalizations are purely for hunting or localization. There are also social calls, and it’s possible some of the calls seen here have a social component to them, but I focused mainly on hunting and localization calls. 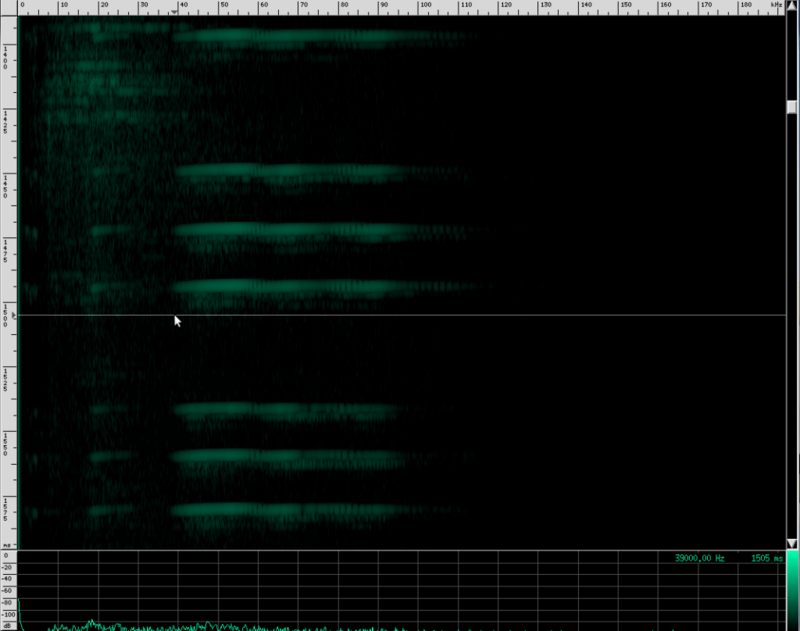 This spectrogram was generated using Baudline. The Y axis is time and the X axis is frequency. This plot spans about 6 seconds. The calls start off fairly far apart, and then rapidly get close together in what is know as the “terminal buzz”. Side note: this could also be explained by a Doppler shift, if the bat were flying toward the microphone and chirping at a steady rate. I don’t think that’s what’s happening here though, because the footage I saw of the researchers recording calls all had the bats flying away from them, and the speed needed to achieve a Doppler shift to produce a fake terminal buzz is faster than any bat can fly. There is undoubtedly some Doppler shift in these recordings caused by the movement of the bat relative to the microphone, but it shouldn’t matter much for our purposes. Notice the spectrum plot at the bottom. 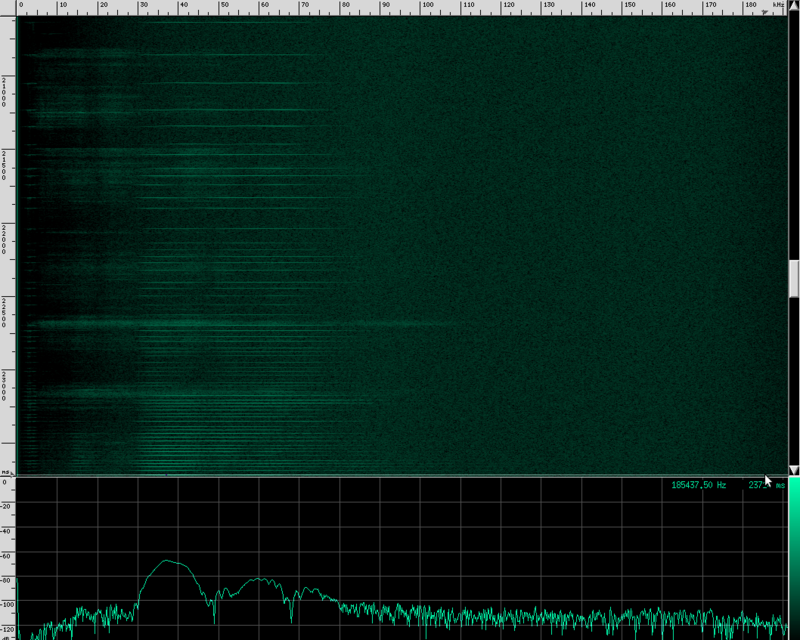 The call has quite a large bandwidth of about 76 kHz. 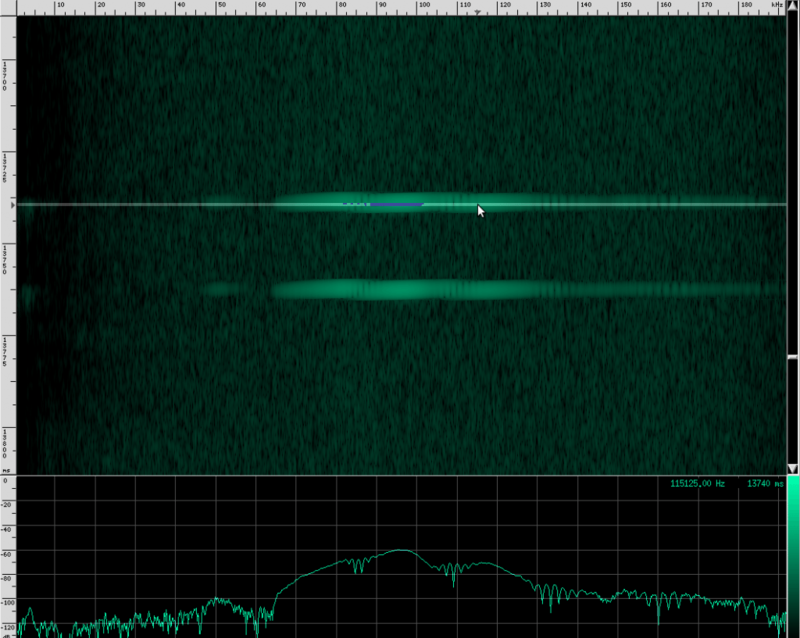 For reference, the human voice has a bandwidth of about 3 kHz, and that’s not even the continuous bandwidth. As you can see, the Heart-Nosed bat sends out a relatively large bandwidth chirp that lasts for about 3 to 5 milliseconds. The bat then changes how often it sends this chirp out based on how close it thinks it is to its prey or an obstacle. This way, the bat gets more frequent updates on the location and characterization of the object. By sending such a large bandwidth signal, it may be able to identify different insects and objects by listening to how the frequency changes when the echo returns. Some objects may resonate at a particular frequency, causing that frequency to be attenuated in the reflection. By knowing what objects and insects attenuate which frequencies, the bat may be able to identify them. The plots above show the results of a simulation of echos off of an insect. Each of the four plots represents an insect with different body and wing proportions. You can see that the spectrum changes a lot, even for small physical dimension changes. Bats can use this information to help classify targets. This may also be aided by using simple amplitude return information. For example, a baffle like the leaves of tree may disperse the sound, resulting in a weaker echo. A flat, hard object like the side of a building will reflect really well and return something much closer to the original amplitude. 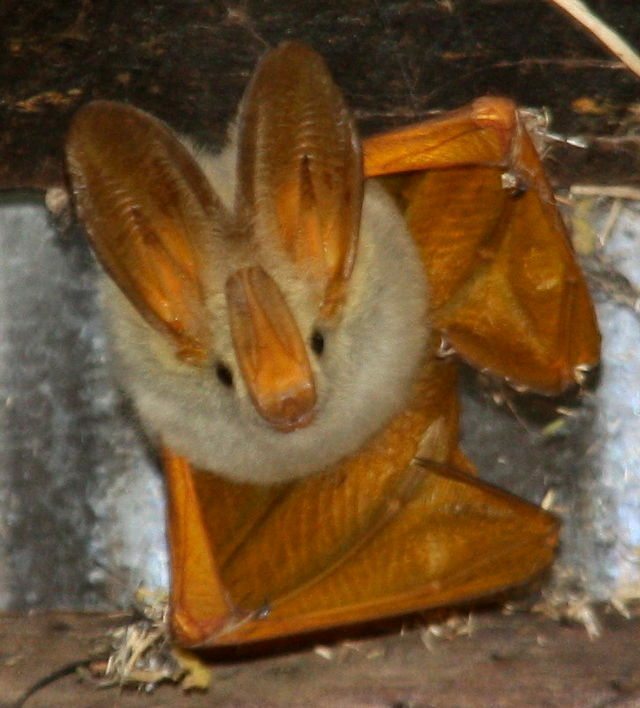 Alright, now let’s look at my favorite bat chirps from the Rhinolophus family. First, Geoffroy’s Horseshoe bat. Their sounds look totally different! This bat is using two techniques. First of all, notice that the chirps are produced in groups, rather than one at a time. 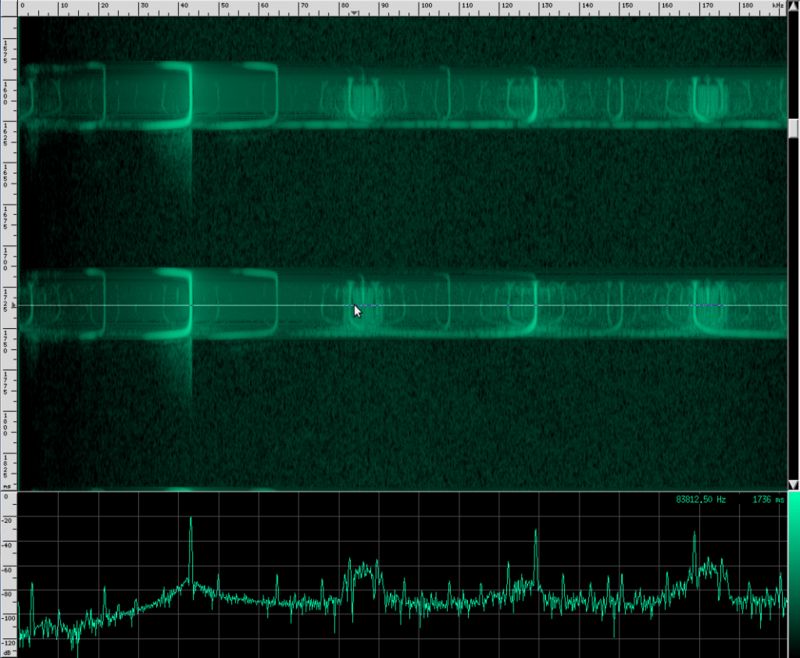 In each chirp, there is one fundamental frequency at about 100 kHz, then another one at about 50 kHz, and two more above it at 150 kHz and 182 kHz. Let’s look at the structure more closely. 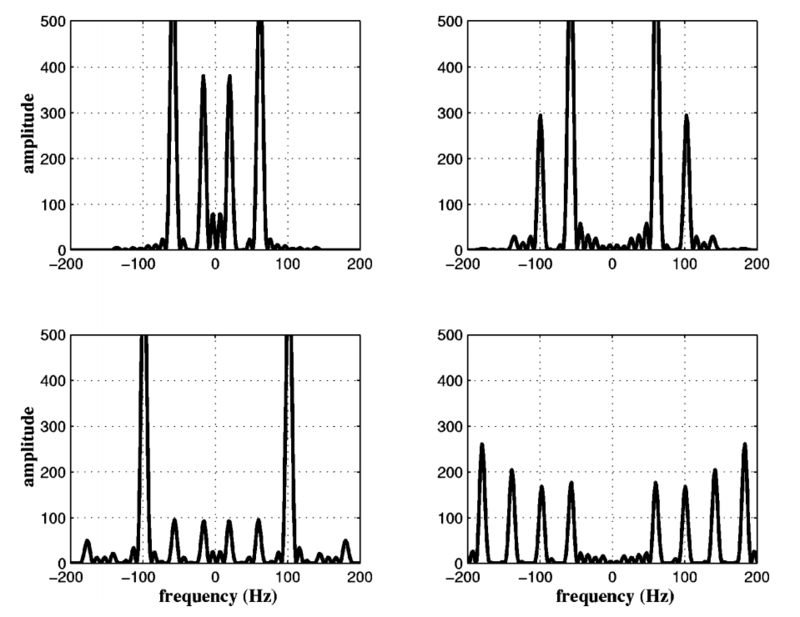 First, a frequency modulated signal is produced, followed by a continuous frequency, and then another frequency modulated signal. 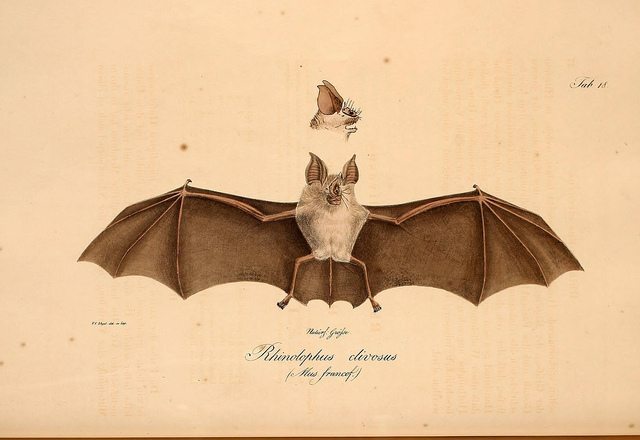 A single, continuous frequency helps the bat determine the velocity of the object it’s tracking, as well as whether or not the object has wings. If a moth is flying away from the bat, the echos that reflect off of it will be Doppler shifted down, meanings that the bat will hear his call echo back at a lower pitch. 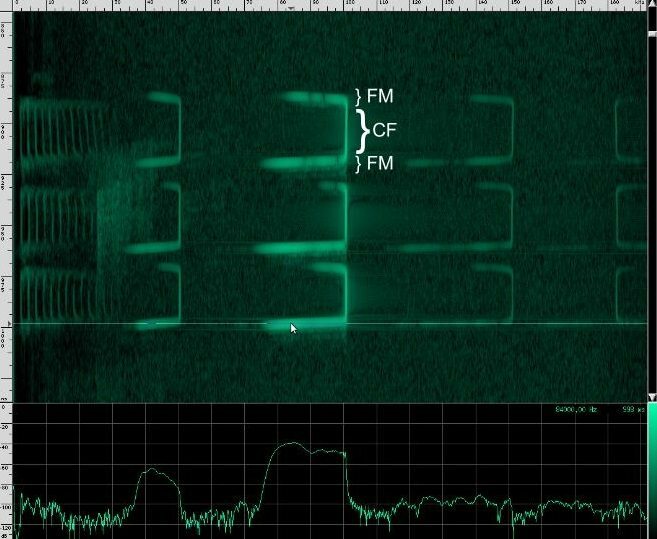 Additionally, the fluttering wings of moths and other insects will cause small amplitude changes and Doppler shifts that the bat can use to help identify the object. 0If a bat is tracking a particularly fast moving object, the resulting Doppler shift may be so large that it lands outside of the bat’s hearing range. To combat this, bats that use continuous frequencies are able to change the pitch their initial chirp to ensure that the shifted returning echo stays within their hearing range. The other advantage to using continuous frequencies is increased range. Notice that the duration of continuous frequency calls are much longer than the frequency modulated calls. A longer duration followed by a longer listening period means that there is more time for echos from further away objects to come back. 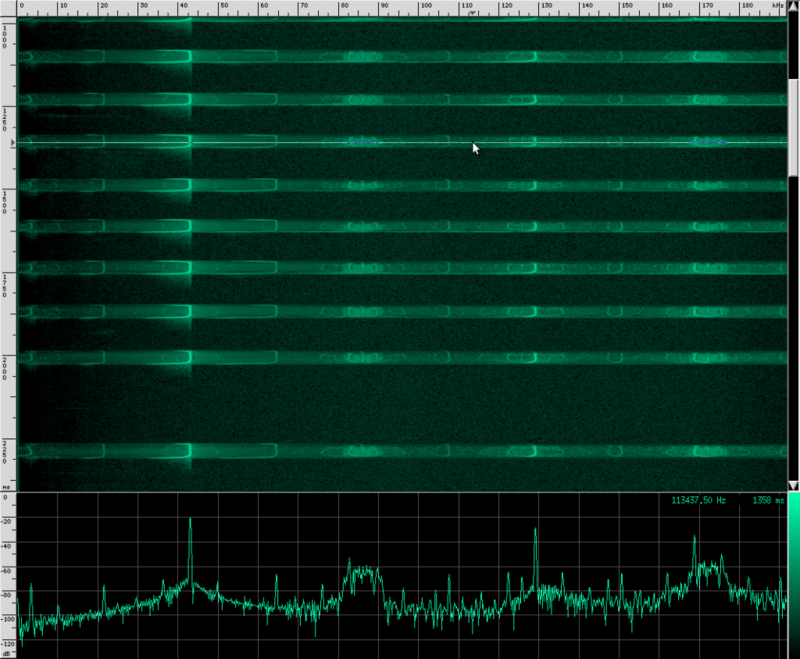 If the initial chirp was frequency modulated, the returning Doppler shifted echo might overlap the transmitting frequencies, but if all the energy of the call is concentrated in a single narrow band, there’s a lower chance that the returning echo will overlap the initial frequency. Because the continuous frequency technique is ideal for greater range, bats tend to use it when they are flying or perching in open, clutter free environments. 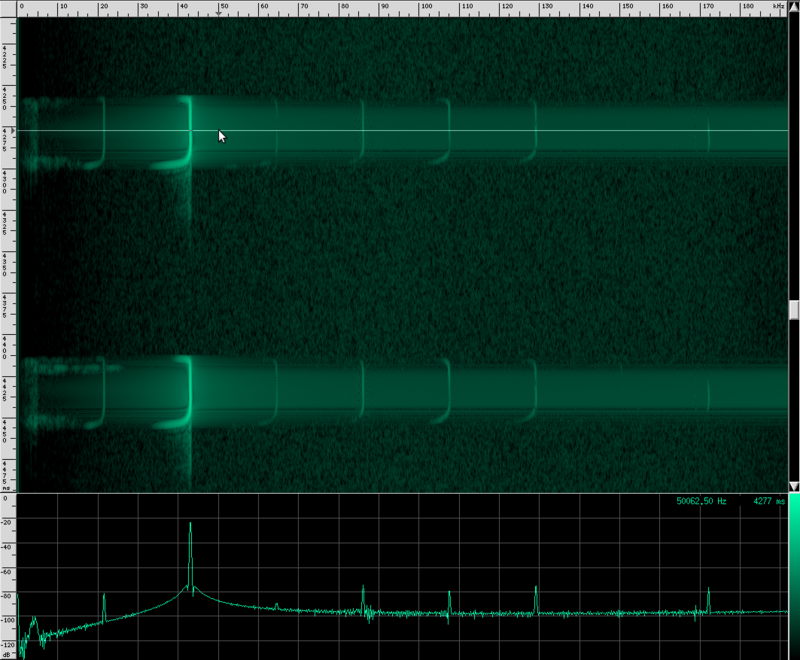 A frequency modulated signal has its own advantages. Because the bat can correlate frequency as well as simple reflection time, the spacial resolution is much better than simple continuous frequency methods. One experiment showed that bats using frequency modulation can distinguish two objects as close together as half a millimeter! Additional harmonics in the call can improve this even further. One disadvantage of frequency modulation is that the effective range of detectable objects is much shorter. 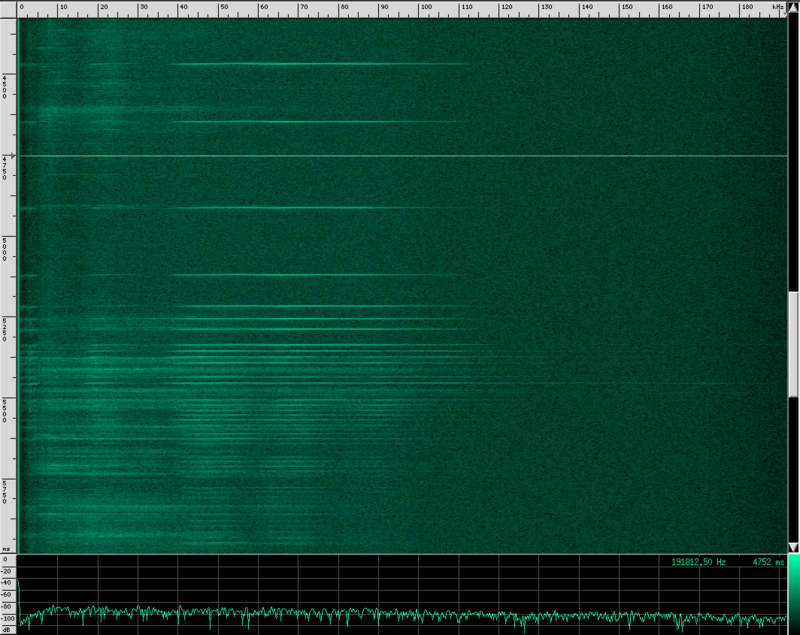 This is in part because the energy of the call is spread out over a larger frequency range. 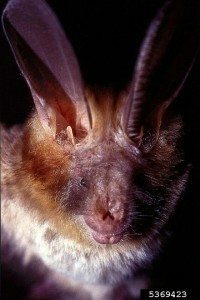 There are some bats that use only continuous frequency, and some that use only frequency modulation, but bats in the Rhinolophus family like Geoffrey’s Horseshoe bat use both. This is one of the most complex biosonars that we know of. Let’s look at another species of Rhinolophus, the Eloquent Horseshoe bat. You can see that this species uses more harmonics than Geoffrey’s Horseshoe bat, and the primary frequencies are different. There are some other interesting artifacts if we zoom in closer. 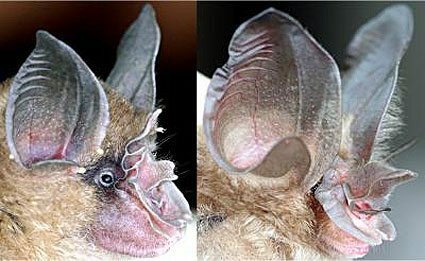 Most bat ears have fairly similar anatomy to human ears. There are a few special differences though. 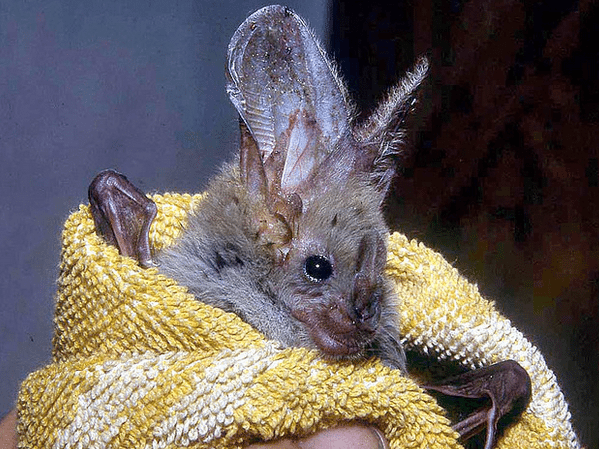 Some species have muscles in their inner ear that tighten during chirping to decouple the eardrum, preventing the bat from damaging its own ears. Bats in the Rhinolophus family, like the last two bats we looked at, have different structures for handling the continuous frequency part of their calls.The basilar membrane is a thin structure that runs along the cochlea and resonates with incident sound waves. Human ears have this membrane too, and it’s part of what determines which frequencies we are most sensitive too. Rhinolophus bats have a basilar membrane that is much larger in areas that correspond to about 83 kHz, which is the frequency at which the bat calls. The auditory cortex of the bat brain is highly sensitive to time. Bats can distinguish sounds that are as close as 500 ns apart. The neurons in this part of the brain retain their sensitivity to time even as the intensity of the signal changes, a behavior that is not seen in non-echolocating animals. This is possible because the interneurons in the auditory cortex will only fire one or two action potentials when stimulated. They also have a very low activation threshold, meaning they can continue to function even the presence of weak signals. 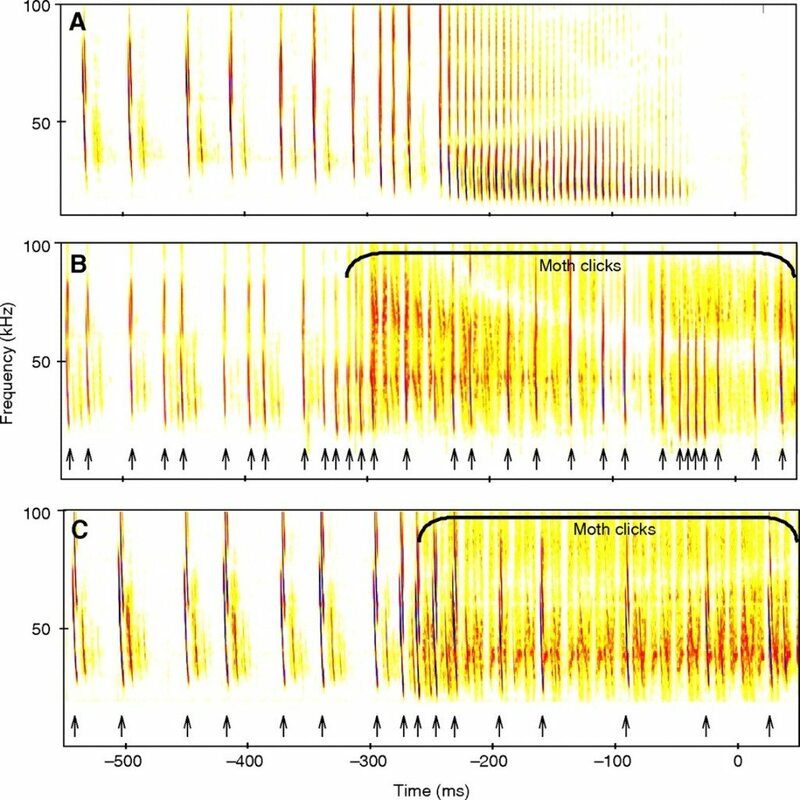 Bats with FM calls have neurons that are tuned for specific frequencies within the frequency shift. What’s really cool is that those neurons are mapped to a grid within the bat’s brain. Each row is a frequency and each column in a time (see Nobuo Suga’s work if you want more detail on this). This same structure also exists in bats that use continuous frequency calls. where Q is the inverse of the fractional bandwidth. So why don’t bats use linear frequency modulation? 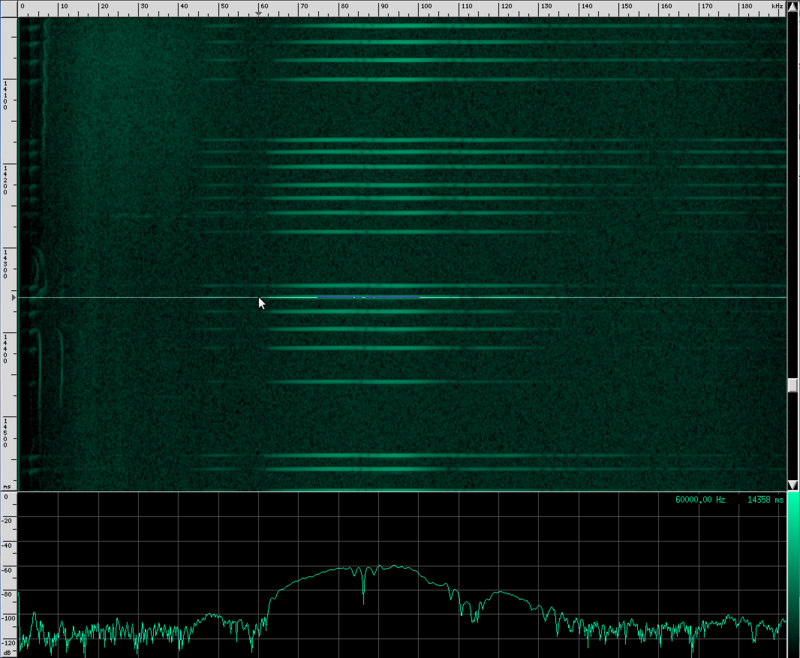 Because a Doppler shifted hyperbolic frequency modulated signal has the same form as the original (this isn’t true for linear FM). This makes cross-correlation much easier. 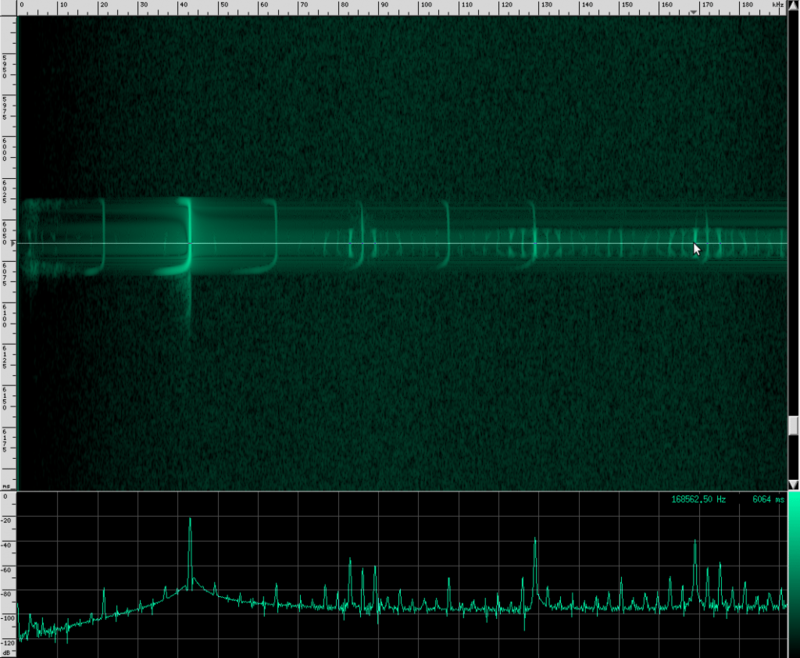 Plot “a” shows the time domain waveform of an original chirp. Plot “b” shows the time domain echo after being Doppler shifted. 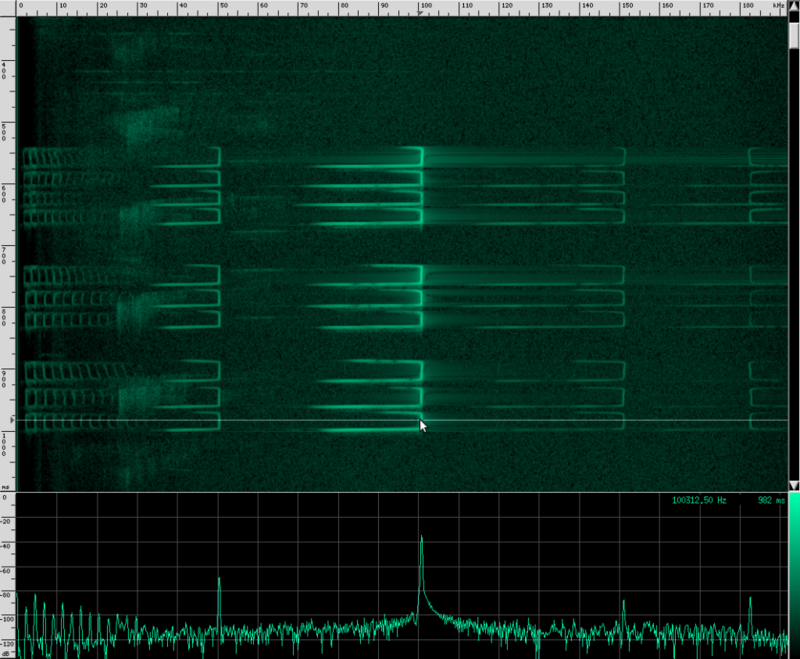 Plot “c” shows the frequency domain version of the original linear FM signal and the echo. Notice how the echo has been delayed and the slope has changed. Plot “d’ shows the frequency domain of a hyperbolic FM signal along with the echo. The signal is shifted again, but this time it’s shifted along the same curve, which makes cross-correlation much more effective. Wikipedia has a nice diagram visually explaining these two functions. Both of these functions are essentially summing up the area under the intersection of two functions as they slide by each other. 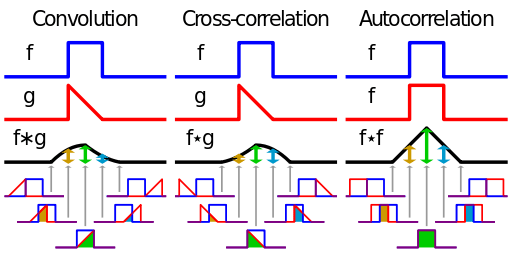 In the case of cross-correlation, when the two functions match, the cross-correlation is maximized. That’s why it’s so important that the echo of the original signal have a similar structure to the original, hence the use of hyperbolic FM. Taken from “How do tiger moths jam bat sonar?” by Corcoran et al. This same technique has been used in electronic countermeasure systems for radar and sonar. Other moths simply produce ultrasonic tones as a sort of sonic equivalent to bright markings on their wings, designed to warn their bat predators that they won’t taste very good. But just as in warfare, electronic counter-countermeasures exist, which are designed to resist jamming attempts. Some species of bats can shift their chirping frequency in response to noise. This switch can take place almost instantly. Despite these countermeasures, Bertholdia trigona has been shown to have an almost 10x higher survival rate than other moths, proving how effective even simple jamming techniques can be. Bats can use interference patterns and multipath effects to determine elevation. 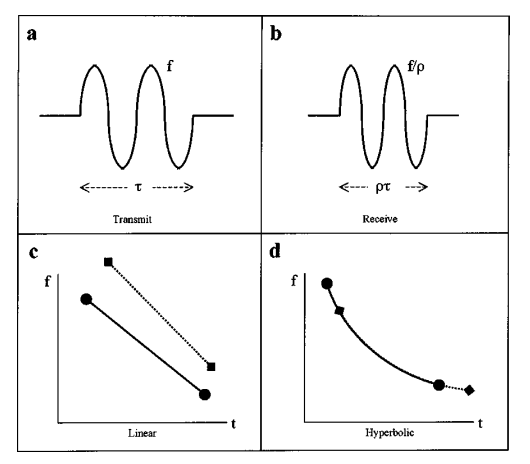 If you’d like a deeper look at the math, I highly recommend The Physics of Bat Echolocation. Additionally, many bats appear to be able to focus their ultrasonic emissions using complex baffles on their faces. Taken from BIOINSPIRATION FROM BIODIVERSITY IN SENSOR DESIGN by Muller et al. And here are the various -3 dB contour maps for some different ears. Frequency is encoded by shading: lower frequencies are darker. 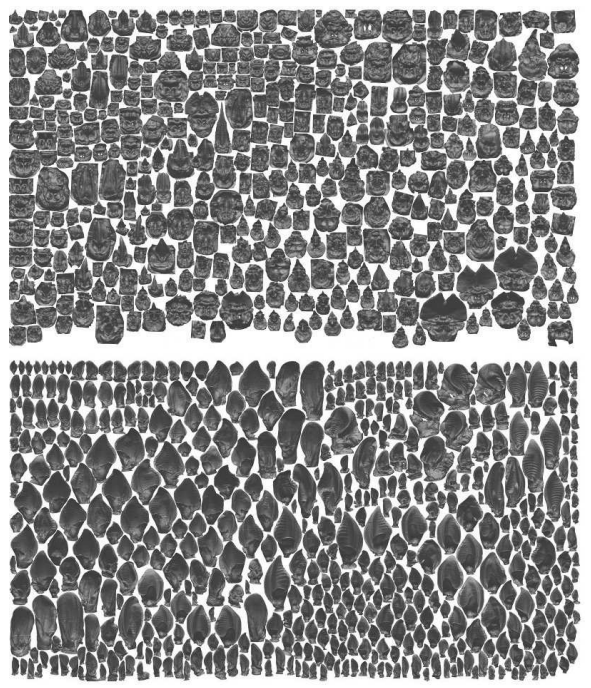 These images are from this paper, which I recommend if you’d like more detail. There are people who spend their entire career doing this kind of analysis, and this is just the tip of the iceberg. There’s so much we have to learn about life on our planet. If you want to dig into more detail, check out the links below. They give a lot more information about both the biological side of things and the mathematical/signal processing side of things. I’m grateful to Dr. Patterson and Dr. Webala for collecting and sending me the bat vocalization recordings that got me into all of this. And thanks to The Field Museum and Emily Graslie for setting up the Bats of Kenya event in the first place! How do tiger moths jam bat sonar? Thanks for letting me know, they should be fixed now!